My dark eyebrows are shaped fine when the hairs are in place, but they seem to want to point in non-fine directions as the day wears on. This creates an odd dent at the arch of one brow. Because of my glasses, it's not readily noticeable, but I still wanted to fix it. I've never had much luck with brow pencils; I tend to play with my eyebrows (hence odd directions) and end up smearing the pencil on my forehead. 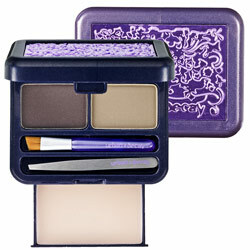 Since I needed a filler and a holder, I got Urban Decay's Brow Box. I use the dark color to fill in my brows, set them in place with the wax, then use the lighter shade to tamp out the shininess. Other people blend the shades, but I haven't liked that as much. There's a palette for blondes and another for brunettes. The staying power of the powder is pretty good, and it doesn't smear. The wax has great hold, but doesn't make my face feel funny. (What is funny is napping with that stuff in. Whoa.) The mild tackiness is also a good reminder for me to not play with my eyebrows. Here's the catch: this box is $30. If you don't have an issue with your eyebrows, that's no doubt a deal breaker. However, if you have thin brows that need filling or thick brows that need corralling, it's worth looking into as one box will last a while.